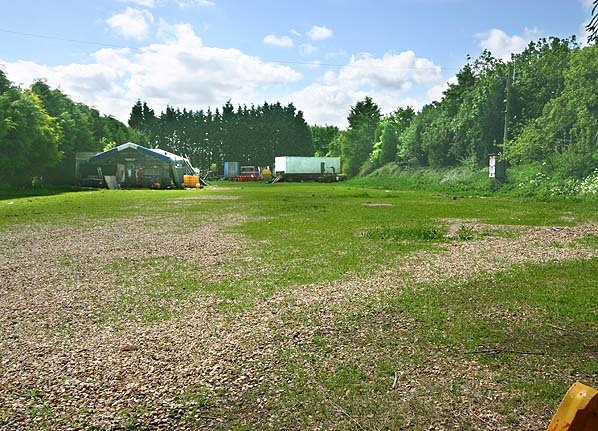 Present state: The station has been largely demolished and the site is now occupied by a securely fenced field used as temporary winter home for travelling showmen. 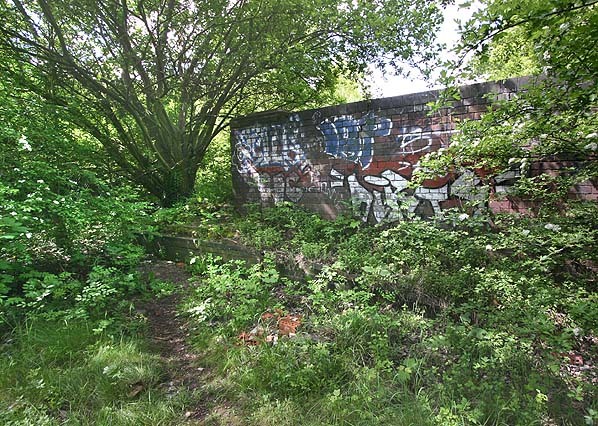 A small section of the south end of the island platform survives on the bridge over Station Road. The bricked up entrance arch can clearly be seen below the bridge which still spans Station Road but the stairway has been sealed at the top. The site of the MPD is now occupied by the Great Central Way Industrial Estate, nothing original remains. Notes: Before the railways came to Woodford it was a small village with little industry apart from agriculture, the railway changed all this, doubling the local population and creating a small railway town. Villages the size of Woodford (61 houses prior to the railway being built) and Hinton wouldn’t have warranted a station but one was planned from the beginning because the decision to build the shed and around it a railway community. 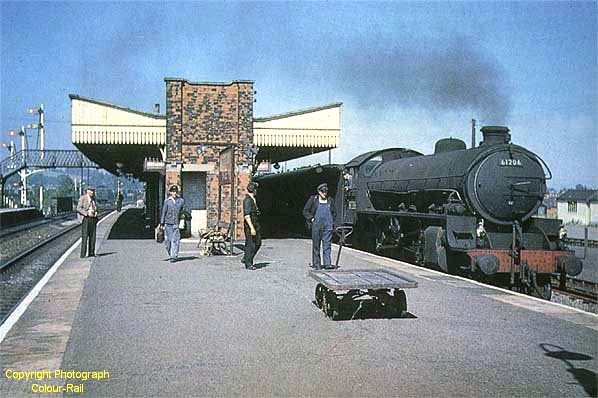 Woodford and Hinton station was built half a mile to the south of the MPD, opening with the Great Central on 14th March 1899, it was a standard Great Central island platform but with additional facilities on the platform with four blocks of buildings under one long canopy. These included toilets, cycle and store sheds, waiting rooms and a porters’ room. There was also a refreshment room but this was closed in 1954 as passengers began to decline. As usual, the sole point of access was from beneath the Station Road bridge from where steps led up to a booking office on the platform. 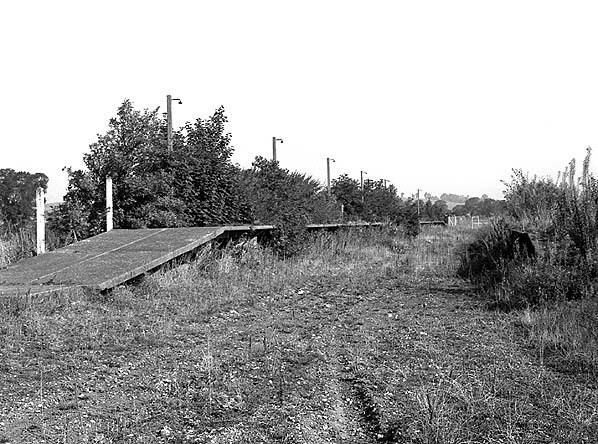 A second wooden platform was provided on the down side of the line for local trains to Banbury and Byfield which were withdrawn in 1964. 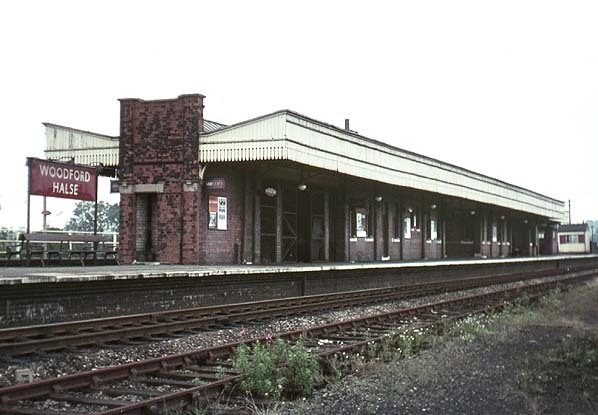 This platform was replaced by a concrete structure in about 1956 although it was still referred to as the ‘wooden platform’. There was a small goods yard with two sidings and a goods shed located on the up side of the line adjacent to the station. station (No's. 3 and 4) and one on the north curve (Woodford West). The south curve which allowed trains from Marylebone to run through to Stratford-on-Avon was taken out of service in 1900. In 1941 additional yards were laid north of the MPD to handle a huge amount of additional freight traffic during WW2. 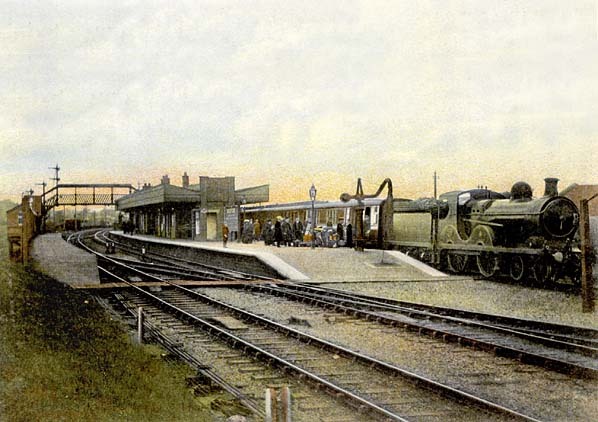 On 1st November 1948 the station was renamed Woodford Halse. It lost its freight service on 5th April 1965 but remained open to passengers until final closure of the line in 1966.
south of Rugby. The track was lifted between Rugby and Calvert leaving a diesel multiple unit (DMU) shuttle service operating between Rugby and Arkwright Street and the southern section of the line between Aylesbury and London Marylebone which still carried considerable commuter traffic. The northern section of the line between Sheffield Victoria and Woodhouse also remained open as this also formed part of the Sheffield to Lincoln line. The line north of Nottingham remained in use until May 1968 serving the collieries at Annesley and Newstead and was eventually lifted in October/November 1969. Sheffield Victoria closed on 5th January 1970 with the closure of the Woodhead route and trains from Lincoln were diverted into Sheffield Midland. Although the southern section of the main line remained open, it too was proposed for partial closure in 1986. Aylesbury was to remain open but all services would run into Paddington via Princes Risborough. Marylebone Station was due to close on 12th May 1986 but the station was eventually reprieved and the closure proposals were rescinded. Following rail privatisation in the 1990's, Chiltern Railways took over the route and in 2006 two new platforms were built at Marylebone on the site of the old daytime carriage sidings. The new platforms and partial resignalling of the station throat now make it possible to run 20 trains per hour in and out of the station. North of Aylesbury the track remains in place but is only used by waste freight trains to the landfill site at Calvert where a junction with the Oxford - Cambridge line remains in use. 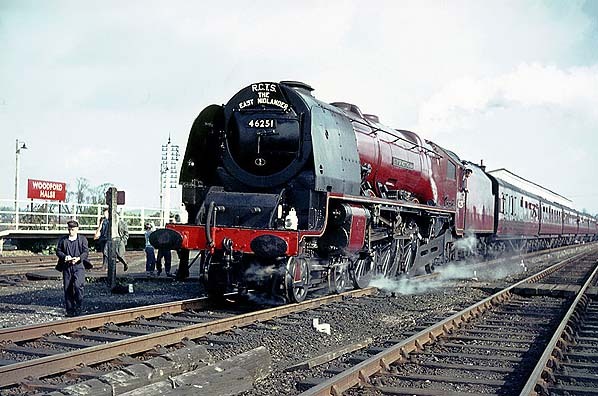 On selected days, usually bank holidays, special passenger services run to the Buckinghamshire Railway Centre at Quainton Road station. There are now proposals to extend the passenger services northwards to a new station called Aylesbury Vale Parkway at the point where the line crosses the A41 near Berryfields Farm. This area is to be known as the Berryfields Major Development Area and will include park and ride facilities for Aylesbury. Rugby reviving a 1990’s government proposal to reopen that section of the line as part of a fast rail link from Scotland to the Channel Tunnel. Too see other stations on the Great Central Railway between Sheffield Victoria and Aylesbury click on the station name: Aylesbury, Waddesdon, Quainton Road (1st site), Quainton Road (2nd site)**, Calvert, Finmere, Brackley Central, Helmdon, Culworth, Charwelton, Braunston & Willoughby, Rugby Central, Lutterworth, Ashby Magna, Whetstone, Leicester Central, Leicester North***, Belgrave & Birstall, Rothley**, Swithland****, Quorn & Woodhouse**, Loughborough Central**, East Leake, Rushcliffe Halt**, Ruddington, Ruddington Factory Halt, Arkwright Street, Nottingham Victoria, Carrington, New Basford, Bulwell Common, Bulwell Hall Halt, Hucknall Central, Annesley South Junction Halt, Hollinwell & Annesley, Kirkby Bentinck, Tibshelf Town, Pilsley, Heath, Staveley Central, Renishaw Central, Killamarsh Central, Beighton (1st site), Beighton (2nd site), Woodhouse Junction, Woodhouse*, Darnall*, Sheffield Victoria & Sheffield Bridgehouses. Woodford Halse Station looking south in August 1975. The island platform is to the left with the 'up'' face of the island platform to the right.